The platform Citify Marketplace and everything tied to it is now for sale. If interested please contact us. There are many ways to communicate with Citify to answer your questions about the marketplace, citifycoin, and anything else you would like to know. It is important to note that if your are having problems with shipping or anything else dealing with a merchant, you should communicate with the shop owners “contact” in their respective profile. Here are some of the ways you can contact us. We will create an android app and add it to the google Playstore free of charge. The idea is to give you another tool to market your products on the Citify Marketplace, while also offering your customers easy and direct access to your store via their smart phone. We hope such an initiative will increase your brand awareness and increase sales on the site. If you are interested, 1. open a store (don’t forget logo and add info) 2. add products 3. Contact us to say you are interested in having a free app of your store. Retailers are not as open to technology as one would assume, many do not have or even want an eCommerce store. In fact about 80% of retailers do not have any online strategy even though they may agree that they should have one. This attitude makes creating an online marketplace for them, very difficult. However, luckily for us there are major data is online which we can take products from local stores and scrape their data. Secondly, there are some who provide through affiliate API and we can connect that data to the marketplace. We will exploit their affiliate program and create revenue in both cases if possible. In other cases, a merchant may not have an affiliate program, but we will still add it in hopes that it will increase traffic. Then there those cases in which retailer X would like to join the network we will offer that we scrape the data from the site, or they may add products via a CSV file. In this case, a 5% commission commision will apply. We would like to offer retailers as many ways possible to participate in the network and not be confined into one simple model. Citify would incorporate multiple models and ways to participate onto the network. Adding products from large retailers and even small retailers unto an online marketplace can be difficult. As mentioned above, we hope to be able to use all technical possibilities to simplify a transfer of data from the retailer to the online store. If this is not possible and the merchant does not want to add products because he/she deems it too troublesome to do. We would offer to send a third party firm to collect photos and data on the merchants behalf and possibly do so regularly if need be. There is also another avenue that we are seeking to use, and that is an automatic detection device that would be able to add products to the marketplace automatically. This however would still need to be developed. Retailers want to have control over their brand, service, and have direct contact with their customers. Retailers might not trust a marketplace to generate the traffic and sales to make their participation worth while. We will use every means necessary to ensure that retailers have the very best chances to make sales online using our platform. We will have account managers for each account and employ online strategies to ensure the maximum opportunity for each retailer to gain exposure, clients and sales. Their brand is respected and used, they have complete control over how they want serve their clients, and they are the only ones who have contact with their clients. It is there packaging, their brand, and their store. We simply give the platform to connect one with the other. Finding funding for such a project is immensely difficult. There are many reasons why VC"s do not want to fund such an ambitious project. One is the high failure rate, the difficulty level, the high costs, and in my case, an untested entrepreneur and not part of a click. They are partly right, however if we find the perfect formula, it may very well be worth the trouble. However, Citify has found another route to fund the project and that is by adding a crypto currency to the marketplace and holding an ICO to fund its development. We think this is far better, it would allow the common man to join in the development and possibly add value to the token they hold where they benefit from their initial, even small, investment. Also holding the token on exchanges is a constant motivator to ensure that the marketplace is always excellent quality. Adding Crypto to the mix. Yes, crypto currencies. In addition to creating and adding our own crypto currency to the marketplace, we thought of adding other crypto currencies as an optional method of payment. The merchant would have the option to add any of the top cryptos including citicoin as a payment method. They can opt out and only accept fiat. It will be their will and pleasure and opt in or out at anytime. Citicoin in particular, is for both payments and for rewarding frequent shoppers to the platform. That will be the uniqueness of Citicoin that the other crypto will not have. Adding crypto to a marketplace as an option for payment and purchase will allow merchants to accept a valid currency to their store. I assume not all stores will be fond of the idea or are possibly not even allowed to, but it will be good for business and profit, while in the same time allow cryptos to become mainstream and have a practical purpose other then technical and speculation. The advantages of crypto are multiple, from payment speed, cost, and discretion. At a later stage, Citify would like to add a delivery system from shop to local consumer. There are some difficulties to this option, but we figure, if other start ups can o so can we. We envision that the delivery providers do not have to be owned or connected to citify, but if the merchant has his own delivery option he is free to use it. However, for those merchants who do not have a delivery service, we would like to give Citify an automated delivery service that would allow 3rd party delivery services to pick up the products and deliver it to the consumers home in the same day and possibly in the matter of minutes. There are many technical difficulties as one codes the specifics for each part of the marketplace. Adding crypto wallets, adding products, delivery system, optional online services, etc etc may all offer different coding and logistical problems, but we think a flexible marketplace that respects the retailers brand, voice and services, might very well be the secret formula that cracks this very difficult business model. These technical difficulties will be tackled one by one with very best technical experts. There are no major direct competitors known, but there are some mega indirect competitors. There is not a day that a person does not mention o me that it would very difficult it not impossible to run against major marketplaces like Amazon. In a way that is true. When we started this project, we simply wanted to be able to order anything we wanted from the city, because we are possible some of the laziest people on earth, just press a button and boom the product is before you. However, major online marketplaces can do this, but neglect the uniqueness of the city, products and brands that people of a region are use to and know, not every merchant is on Amazon, and not every merchant is easy to find online. Also, we hoped to be able to make a change, and save the retail business, small and great alike in our own region. In my case, I wanted to save the Canadian businesses and place them on the map much like Alibaba has done for Chinese goods and services, but wanted to make it in such a way that people can order locally simply and without hassel. The local merchant marketplace online has been a business model that has floated around for quite a while now with mix results. It's success depends on many factors, but we are confident that it is a valid business model that simply needs to be designed and promoted as a powerful tool for both merchants and consumers. Citify, the logical conclusion to the trend. There are so many apps that have been developed recently to make shopping for local deliveries from everything from food deliveries to groceries. It would only make sense that one app would conjoin all these services into easy to use app. Instead of fumbling over a thousand apps to get one service or another, why not just one app to have the whole city into the palm of one's hand. This would greatly simplify shopping and become a great benefit for consumers and shop owners alike. Citify, therefore, is the logical conclusion to the ongoing trend of local ubernization of shopping and the empowering of consumers to find, locate, and purchase local products online. Some have asked how will Citify add all the shops with in the city on the Citify network., since to them the task seems so daunting and nearly impossible to accomplish. The shops are added in phases. Phase 1: Citify will add affiliate stores available on affiliate networks and connect them to the network through API. This includes data from apps that have already accumulated local stores and service providers. This will allow Citify to monetize through affiliate marketing. This alone should add millions of products. Phase 2: Citify will locate stores that have eCommerce websites and connect them to the network. Citify will monetize with those ecomm stores that have a native affiliate program. Phase 3: Citify will use data providers that have stores and their products available and connect it to Citify. Citify will monetize with those ecome stores that have a native affiliate program. Phase 4: Citify will recruit stores and businesses that either do not have any online presence or would like to add their products on another ecomm network. These are the ways that Citify projects to accumulate all the products available in a given city in the beginning until the site becomes a natural and logical place that a business will consider to place their products and services for sale. In the future, we hope that those stores that have been added as affiliates will change as full fledged additions to the site and benefit from Citify's service like those stores that have added themselves in phase 4, which includes payments with citicoin, a point of sale, and later, a delivery service from shop to consumer. It is in this way, that most of the products and services in any given city will added and available on Citify for easy online shopping within ones city or to browse through the products available in another city. Shopping meant spending hours store hopping for the best deals or for a particular item. Not anymore, with the rise of ecommerce platforms shopping is simplified and efficient. This has changed the retail dynamics leaving many in the retail business struggling to cope. Many retailers in response have either ignored ecommerce or have opened their own ecommerce with some to little success. Citify purposes a marketplace in which all brick and mortar stores share a same ecommerce marketplace/directory and delivery system to maximise sells and customer retention in the face of modern challenges. What differentiates Citify from the other online Marketplace is that it focuses on the products available in the city. Citify’s mission is to help local stores and consumers connect in a practical and efficient fashion. • Consumers: Individuals who want to be able to order anything from their local stores may do so on one site. • Store owners: Retailers expand their customer volume beyond traditional channels. • Citify creates a convenient way in which consumers can find local products, browse through store inventory, search for particular items, and buy them online. This means that the consumer does not have to browse multiple websites, and has the ability to compare prices within each store in one online location. • Citify creates the convenience for consumers that all this information is stored on location and can be accessed through their smart phone, tablet, and computer. • Citify offers consumers customization of the way they are served. They can go to the store to pick up the item, have it delivered to their home or any other location which they are at the time. • Citify offers the convenience of browsing and buying products from their city or other participating cities around the world. They can also receive products from their city while away in another location (if the merchant offers that possibility) direct contact with merchants and the ability to leave reviews questions for the merchant to answer. The company offers five value propositions to merchants. • Citify simplifies brand and product recognition. Consumers as they search through the platform either on the product marketplace or directory, may find a store that would otherwise overlooked. • Citify makes it easy for any brick-and-mortar store to have an instant ecommerce store for sells and payments online. The online market allows stores to take multiple orders online. • Citify generates more sells on the marketplace as there is more click traffic and shared marketing efforts to bring traffic to their online store. The stand alone sites may generate traffic, but, much like the shopping mall model, an online marketplace can bring in more online traffic. • Citify allows merchants to care for their clients their way, create their own policies, chose any delivery system they wish, and have access to a local delivery system. • Citify offers easy social media share buttons, an affiliate marketing system, app, chrome extensions, e-mail marketing, IPTV stations with a shopping channel, for more exposure for local businesses. 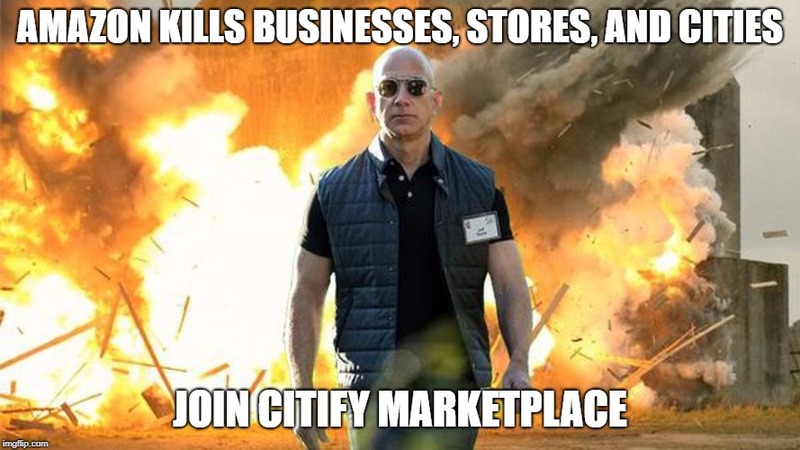 Citify is the only online marketplace that allows local merchants to have a free brandable site, so as to allow the merchants to sell more of their products either locally or internationally through a city online market. Citify aims to be the e-commerce solution for city merchants business to consumers (B2C), suppliers or business to business (B2B), service providers, and particulars consumers to consumers (C2C) with a searchable site within a given city and to also to offer shop-to customer same day delivery. Our objective is to help city business connect their products or services with their own brandable e-commerce solution that may attract potential local and international clients. Our philosophy is that a city’s strength is on the ability to give all businesses all the tools they need to generate revenue online and offline. Our product is a tool to help businesses, suppliers, and service providers within a given city to sell on an online market focused on both local and international markets. While in the same time reap the advantages of an increase in market reach, an increase in revenue opportunity, an improvement in efficiency, and an expansion in product diversity. This we believe can be achieved by having a shared online marketplace where businesses can add their products, location, and share a delivery system same day shop to customer service to maximise awareness and sells is the best model to achieve success. The product is an e-commerce multi-cart system, created in html, CSS, Java Script, and JQuery, in the framework Bootstrap, with smartphone app to simplify access. It will have a responsive design, searchable data base, and its servers will be located with Marketplaceinc. Our product is an online searchable platform for which merchants can open their own brandable online store for free in exchange for a percentage per sell and optional advertisement services. The platform will have all the essential tools needed to sell online while also being a member of a local online community. Merchants will be able to have their own loyalty programs, and a free point of sell connected with their shop, and everything else required to run a successful shop. Merchants will also be connected in real time to all their social media, other selected selling platforms. The platform will also allow service based businesses to post coupons to entice consumers to visit their store. It will be mobile friendly allowing a geolocation of the closes store in which a product can be found. There will be an online directory to find a particular business or businesses within the city according to category. This product should allow merchants to reach their potential local and international clients far better than randomly searches online, thus, generating local traffic to their site. On the consumers end, the online services allow consumers to buy, reserve, browse, and find, compare, review, rate local stores, products and services online through any device. Furthermore, it gives the consumers the power to have their local store products at their door with our delivery service. In our own market research we have found that 80 percent of most merchants surveyed, in Montreal, do not have any online shop in any form, and this irrespective of the many online platforms open to them. Most merchants are aware of these other platforms but often state that they are irrelevant, expensive, disadvantageous, damaging to their brand, and /or deem it too time consuming of a venture. Some of the merchants whom have used online platforms found that they were unsuccessful to attract clients and gave up. Only 12 percent found that their online ventures were successful. Some of the merchants we have found outright resistance to the idea of a marketplace, because either they saw it as a competition to their online strategy, miss understood, or did not understand the concept or simply said they would not have the time to contribute to such a venture. Citify will develop a strategy to bring these hesitant retailers onto the site. When asked about an online city specific marketplace 90 percent of those surveyed found the prospect of such services might be helpful. There is an estimated 107,000 micro or small businesses in Montreal alone. Canada has about 1,107,540 businesses where only 36 percent of all small businesses have a website, while 91 percent of big businesses have a website. As we grow and expand it will be possible to tap into the American market where there are 28 million small businesses in which as much as half of all small businesses do not have a website, more so, do not have an e-commerce solution. Businesses who do not take advantage of the online market shift are losing out on many of the advantages that an e-commerce solution can offer and more importantly on the potential profit increase and growth of their customer base. The e-commerce industry is a 1.6 trillion dollar industry where 40 percent of all internet users have purchased something online. This totals to about 1 billion potential active buyers online worldwide. The expected growth in 2015 is of 20.5 % comparatively to 2014. According to US statistics people are buying 24 trillion dollars woth of products worldwide with an 6.6% growth expected in 2015 and it is only projected to grow. As advantages and technology improves, it is foreseeable to expect that this trend will transform the function of traditional physical brick and mortar shops into showrooms and product displays. However, though there are an estimated 12-to 24 million online stores, only 650,000 stores generate more than $1,000 a month. We believe the main reason for this statistic is the lack of traffic unsuccessful merchants and their products receive, this is one of the issues Citify is here to ratify with a smarter way to find local and international consumers. Citify is poised to help city merchants to have their own searchable online market, so that local, ex-pats, and international clients can find and purchase their products. The growth potential is enormous as more and more companies are seeking to get online and sell their products. Furthermore, given the growing demand from consumers for businesses to be online, and the number of businesses without an ecommerce provider, it is very likely that Citify will have a large share of the market as it expands. At present, consumers feel confident enough to buy and trade on e-commerce sites. The only factor that hinders Citify from entering the market is the high cost of web development and advertisement. The few ways to overcome these barriers is to attract investors and strategic partners into investing in its development. Citify clients will see the product as an indispensable utility and relatively inexpensive means to market and sell their goods and services to local and international clients. It will be easy, risk free, and potentially very profitable for them to use the service. The interface will be fresh and modern and time saving in terms of advertisement and selling on other markets such as Amazon. Merchants in general do not want to spend lots of time and money on this venture and wish t to be as simple as possible, and citify aims to make it happen with the absolute best tools technology can provide. • Feed parser, to connect stores that have fresh impute from clients online stores. • Payment portal through Pay Pal, accept credit cards, debit. • Free Point of Sale (POS) connected to the marketplace. • View online via mobile devices for what is in the store before even. • Rate the store, the products, and have a personal experience with the product and brand. Citify’s main objective to give merchants suppliers, and individuals of a given city to sell their products online through our e-commerce site. This means that Citify’s main customers will be individuals whom either already have a traditional shop, a factory, or a home business. The only criterion is that they are in the same given city. This, therefore, may include a very broad client base and every individual in every socio-economic class, gender, and education. The targeted consumers will be primarily the local residents of a given city, but will also include potential international customers who wish to have products from this city. One can imagine ex-pats that wish to have a product only found in their native city, or the client abroad that wishes to have a certain product found in a given city. The main difference between Citify and the other big e-commerce names is that they are either stand alone e-commerce, or big e-commerce platforms. Citify does not enter into either category completely, since it is more of a hybrid of both. The merchants have a stand alone store while also being in a market place. The other e-commerce solutions, like either Shopify or Amazon are not concerned with one city in particular. In the case of Shopify, the merchant is left to his devices when it comes to attracting customers; in the other like Amazon have the advantage of huge global traffic, but is not concerned with the merchants image or brand. Comparatively, Citify is designed to attract both local and global consumers while merchants can still have their unique brand respected. Therefore, Citify’s competitors can not be said to be true direct competitors, since Citify solves a problem that these marketplaces do not, and that is to allow local businesses to target local customers while in the same time sell their products globally. Citify’s strength is its flexibility, and its genuine interests in the profitability of the local city businesses online. Since we are local we can cater directly to the trends and needs of the local shops and suppliers, and always have the pulse of the changing trends in a given city. Another benefit is that a merchant who is unwilling to change website can always link a Citify e-commerce solution store to their current website seamlessly. Citify’s niche is the local shops and the local residents that will benefit from our unique city index search engine for a given city. Citify will use all affiliate product data available from stores, API integration and feed parsers, to upload millions of products onto the site instantly and generate revenue through affiliate percentages. Furthermore, this will break the static, give a sense of success, and raise the Citify brand as it is connected with bigger better known brands. For medium and smaller with a web presence we will offer to open a store and scrape their online product data and upload it onto Citify. For small to medium shops without a website, we will offer to visit open the shop, take pictures of their inventory, create a CSV file for them and upload it unto the shop. This is to help break the resistance that many small shops might have to the ecommerce venture in general. This will require a sales team and photographers to accomplish this task. For medium and big shops, who do not have an online presence, nor a CSV, or data feed, but are common products, we will offer a barcode product recognition system in which they can simply scan their items and have instantly appear unto their Citify online shop. The idea is to gain a very personal relationship with retailers, merchants, suppliers within a given city and guide them through the technological revolution. To maintain a very positive relationship with our merchant clients we will do anything to cultivate a feeling of support and mutual respect. • Cultivate and sponsor business and social events that help small merchants to gain more profits. • Cultivate networking events for local businesses, retailers, suppliers, and service providers. • Participate in charities and events where the business community in present or actively engaged. • Work as a connector between businesses online and off. • Be personable, approachable, open, honest, and think of the best ways in which to help our merchant clients. The desired client perception of citify is one of a friendly utility who beneficial to the community. Not only must Citify strive to give outstanding client service but also maintain a reputation of on of creating and making benefits for the city in which it is present. • Our product evangelists will give pamphlets out on the busiest streets while wearing a shirt bearing our logo. This is to get consumers to become familiar with Citify as a shopping site. • Pamphlets sent to residents in a given city to inform them of specials that can be found on our site. • Booklets that inform consumers of specials and products available on the site. • We intend to be very active in every community in which Citify is present. This is a passion that we intend to pursue. • Being active in the city’s community. Citify revenue is based on its unique microcosm which many e-commerce providers do not have. Thus, this will allow us to accrue more potential revenue. This is a list of to be activated revenue streams when the site is founded. There are some products yet to be determined, since they are yet to be created. The first focus is to develop the ecommerce site. The essential is that citifies gains traction and generates through revenue percentage per sale and pay per click sections of this business plan. The other revenue streams will be phased in soon afterwards. Citify gives a free shop to every retailer merchant in exchange for a 10% referral fee after each sell. This fee is taken automatically after a sale. This allows the merchant to open shop without any risks and will pay only after the sale. This is a good plan for shops to start with. This is might be better suited for merchants with a lot of low cost items. Citify will use all available affiliate marketing data from big medium and small stores from around the world to be the initial revenue from the millions of products that will be feed to the marketplace through feed parsers. Such feeds can be found many affiliate marketplaces that will give us access to affiliate API, CSV, Data feed and generate revenue from such affiliate marketing that fits perfectly with the purpose of citify. Citify’s front page will have a side bar for ads about various stores. This may attract a consumer’s attention and lead them to the advertisers shop. These are revenue share opportunities that might arise. They can be had through partnerships with payment portals, credit cards, products and services etc. All avenues will be explored. A printed booklet will be sent to every targeted consumer to increase visibility for the site and for the merchant products and services. Paid advertisement. A delivery service will eventually be included with the ecommerce solution. This is still in the stage of development and will be included later as Citify develops. When I first came up with Citify, it was simply because it was impossible to simply find products with the stores within my city. It is quite frustrating to shop for local stores online. This is why, I assume, many consumers will turn towards the well known well trodden avenues of online shopping and at the expense of the local shops and services within the city. Merchants themselves are overwhelmed with the advent of online selling and I think are in need of a marketplace of their own, where they and their products are the focus and not some unknown merchant across the world. I believe that a singular e-commerce site will not attract the same amount of traffic as an online marketplace, the same as a a shop on the corner of the street will not gain the same traction and interest as one set up in a mall. We envision a world where a consumers can get anything within their city and other cities around the world at their finger tips. It is not impossible to imagine that a consumer can simply ask for something and have all the local options instantly nor is it impossible to imagine that they can even set it in such a way that a certain product is delivered within an hour or even set a product to be delivered every set day within the month. All this, I think, will eventually become the future of retail. We are living in exciting times. Times where needs can be met almost instantly. I believe that a local marketplace to allow shoppers the ability to see and receive anything and everything from within one's city or from any city around the world is part of that future, though local online marketplaces are not a new concept, what is new is that Citify is determined to make it a far more common utility which consumers can use and rely upon for their shopping needs, while other marketplaces seem to treat local shop owners as an after thought in their business model. I do not think that stores or malls are going anywhere, just I think an online mall with all the stores and products within a city would be an added utility that can greatly benefit stores and consumers alike. It is an idea I believe in, a vision that I think will make shopping simpler, smarter, quicker, and better, and it simply does not seem to exist anywhere online.